First, you can find the code in my GitHub account. So if you want to clone it and make your own changes, you are free to do it. Every event that may occur in the client (the web browser) will be handled by our Backbone.js code. As we said previously, we are going to use Express.js to do that. Express.js is a web framework based on Sinatra that allows us to create a web server easily. Although you may find more code in GitHub, the above code is all you need to run a server using Express.js. Previously, to do anything you should import the required libraries. In the code we see that we are going to need express and sys. In fact, the sys library isn’t required in the code because nothing is printed to the console. After that we simply create a server from express and define a method get that will handle with the requests that are sent to our root URL. This method will reply with a HTML5 page called index. As long as we are going to use Jade, we need to add a couple of line more to our code that set Jade as our template engine. Besides that we need to specify from where our Jade files are sent. We have seen that the index file will be sent to the client (web browser). The index.jade file looks like that. The good thing about a CSS preprocessor it that you can add some salt to your CSS. You might want to define CSS variables, create functions or use mixins within your CSS files. 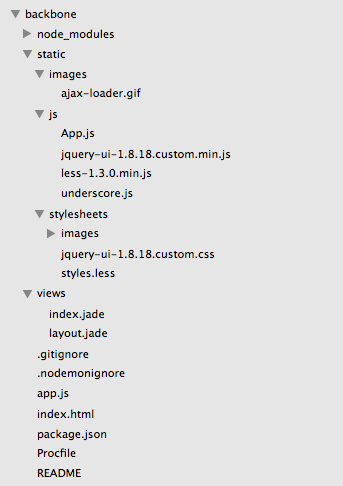 Our Backbone.js code is saved in the static/js folder within the App.js file. As I said previously the Backbone.js code isn’t the best Backbone.js code you might find out there, but you may find suitable to understand how Backbone.js works somehow. var img = "<img class='tweeter_photo' src='" + item.get('profile_image_url') + "' />"
A Tweet Model. This model defines a Tweet class. If you notice, this model isn’t define any property as name, photo or location for it. We can do that overriding the defaults property. Tweets Collection. It defines a collection of tweets. To that we must define its model as a tweet model. Besides that we are going to indicate the url where we are getting our tweets. In our case is a REST services provided by the Twitter API. There is a parse function that return the Tweets collections. Location Collection. It defines a collection of locations. It will call the Yahoo Geolocation API to get the information it needs. Although I’ve created this as a collection it should be more correct a simple model because we only need a location. el. It links this property with a DOM element. If it’s not defined it’ll take a div element by default. In our case we link the el element to the body element within our HTML5 page. events. It defines how it will react our view when a specific event is triggered and the method that handles with that event. We define that when we click our Search button a doSearch method will be triggered. initialize. Here we can define and bind events to those methods that will handle them. In our case we bind our tweets collection to a reset event. The reset event will be triggered after we call to the fetch method. Besides that we create a map and call the render function. The render method will create the application’s home page we saw at the beginning of this post. doSearch. The doSearch property will fetch a collection of Tweets. This fetch will trigger a reset event that will be intercepted by the method defined in the initialize property. For each tweet we call the addItem property to add it to our page. render. It will render the page. addItem. It will add the tweet information to our page. At the same time it will call the Yahoo Geoplanet API and Twitter API to get more information about the location and the user who wrote that tweet. Besides that it will add a point in the View’s map for each tweet.